A chapelry of West Tarring, of which the structure is probably later C12 with some C13 alterations, it fell into disrepair in the C17. The first phase of a reconstruction was in 1914 and it was completed to a different design in 1941. 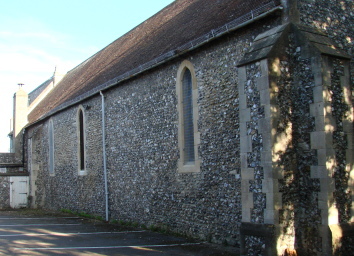 Durrington, is mentioned as a chapelry of West Tarring in Domesday Book (13, 34). Like Heene nearby, it fell into disuse in the C17, because of population decline and the unrest of the day (3 p75). By 1677 it was in disrepair (2 p546), but it was used for weddings until about 1750. Curiously, it is said to have become a separate civil parish during this period, at the latest by 1730 (Horsfield II p200). The present dedication does not appear to be old. 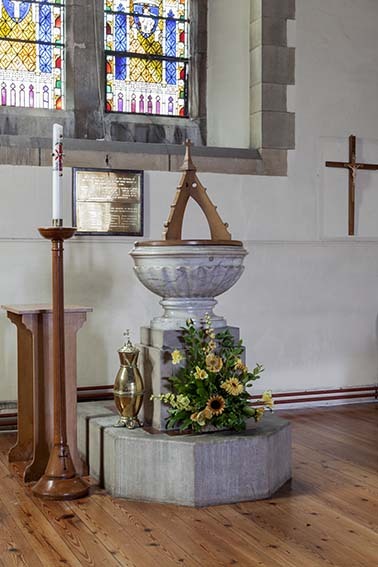 There are indications that the church was in the Middle Ages dedicated to either St Thomas à Becket or St Nicholas and may at one time also have been dedicated to St Peter. However, it is also possible that the last was considered as an alternative before the present one was introduced at the rebuilding in 1912. This is a most unusual dedication, one of three in England (information from Nick Wiseman). In 1806 the site was said to be choked with briars (2 ibid), though as late as 1892 the groundplan could be discerned (1 p159) and much of the north wall stood. This had lancets and Nibbs’s undated etching (in his 1874 volume) also shows what seems to be a circular opening, though most stone dressings had gone. The Burrell Collection picture of the ruins (1778) shows a round-headed chancel arch, which looks mid to late C12 and according to Hussey (p223) there was in his time a fragment of the north chancel wall with a small round-headed window that could not have been any later. Though the lancets are more probably C13, these features probably reveal the date of the main structure. As the population grew again, an iron mission room was opened alongside the ruins in 1890 (3 p78) and by 1892 efforts started to rebuild the chapel. In 1896 R S Hyde produced designs (CDG 28 p50) and again in 1912 with his son (CDG 221 p92), re-using the old walls where possible, but there was no progress. This was probably because of a dispute over the ownership of the site (CDG 230 (1913) p159), but once this was resolved work began in 1914 to another design, variously given to S T Hennell (misspelled ‘Kennell’) (CCC) and L W Ridge (RIBAJ 29 (1922) p545, ICBS and WWA); Hyde had died a year before. There are no features that would identify the architect conclusively, but the number of contemporary sources giving Ridge and the fact that he was a prolific church architect in Sussex makes him by far the likelier, particularly in view of the traceried window in the south aisle, a conservative feature by this date, and surely more likely to be the work of an elderly church architect like Ridge. Hennell did little church work and certainly never claimed this one in any reference book. As construction began, a separate parish was established and the nave was completed the following year. Work included a new south aisle, as very little was left of the old south wall. Much of the mediaeval north wall remained, including the lancets, which were made good, and this had remnants of old render. 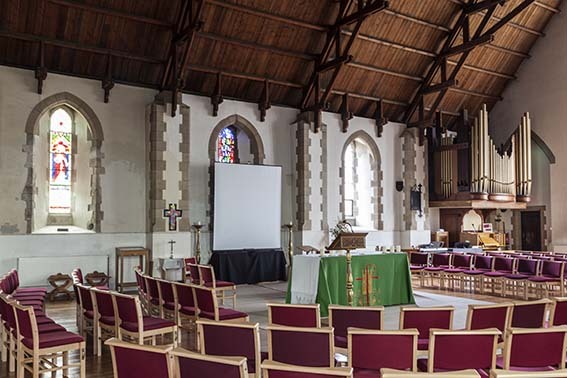 The inside is a surprise, for nave and aisle are roofed in a single span with simple hammerbeams. 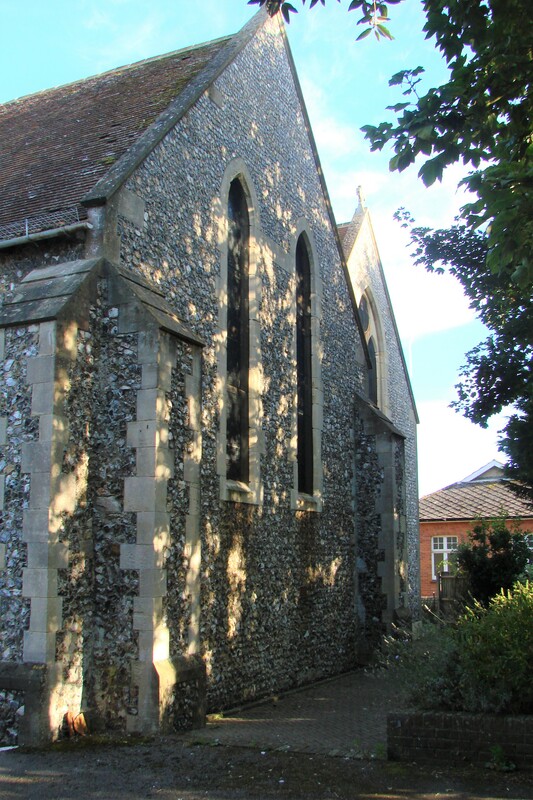 Only at the west end are the two parts of the church separately roofed, to allow the retention of the short remaining part of the old south wall. No more was built at this time, though the design attributed to Hennell includes a central tower and apsidal chancel. It stood incomplete until 1941 when, in the middle of another war, W H Godfrey completed it to a less ambitious design (WSRO Ep I/41/6). 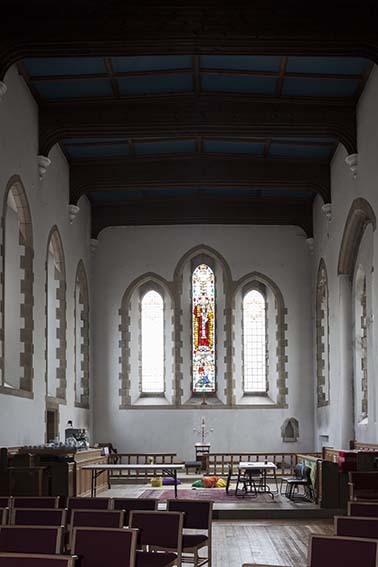 He added a chancel without an arch with even plainer lancets, including three stepped east ones, and an almost flat roof behind a parapet; inside, there is a panelled ceiling. An intended squat south east tower and spire are marked only by the outlines of arches in the south chancel wall and the east one of the south aisle. Without this, the exterior lacks focus, especially from the east, which is the main approach. There were general repairs by S Roth in 1961-62 (ICBS). More recently the church has been re-ordered with the main altar placed against the north nave wall surrounded by a semi-circle of chairs. Font: Scalloped white marble on a round stem. 1. 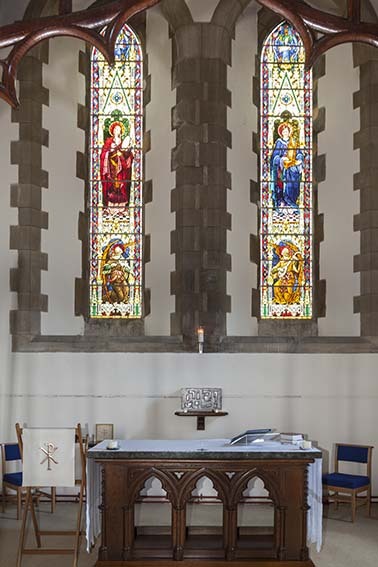 (East window, centre light and south nave, second window) Barton, Kinder and Alderson, 1950 (WSRO Fac). The centre light only contains a figure with clear glass in the side ones with simple patterms in yellow glass. 2. 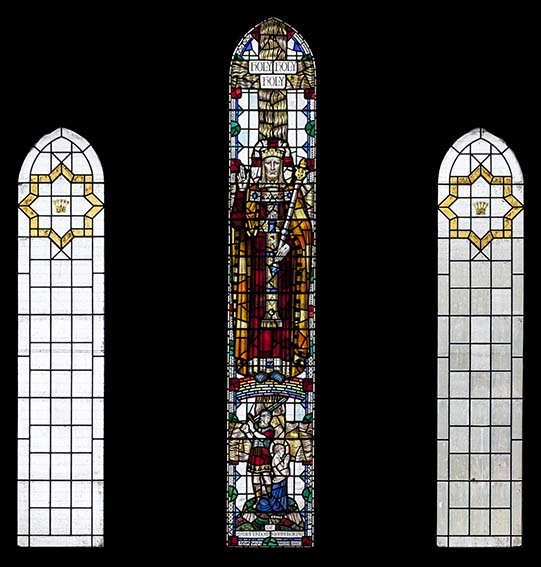 (South nave third and fourth windows, north nave, third window and west windows of southern and northern parts) A L Ward, 1921, 1925, 1929 and 1934 (ibid). 3. (North nave, second window) Abstract by M May, 1972 (signed). 4. (North nave, fourth window) J Cackett, 1990 (ibid). 5. (South nave, first window) M G Lasson, 2001 (CBg 117 (May/June 2009) p54) The individual pieces of glass are larger than usual with little drawing except on the figure. My thanks to Josie Campbell for the photograph of the east end exterior and to Nick Wiseman for the remainder except the other one of the exterior.